Press Statement Read By Minister For Information, Mustapha Abdul-Hamid (Ph.D), On President Akufo-Addo’s Implementation Of Recommendations Of Chief Justice’s Committee Set Up To Look Into Petitions Against Mrs. Charlotte Osei And Her Two Former Deputies – NPP USA Inc. 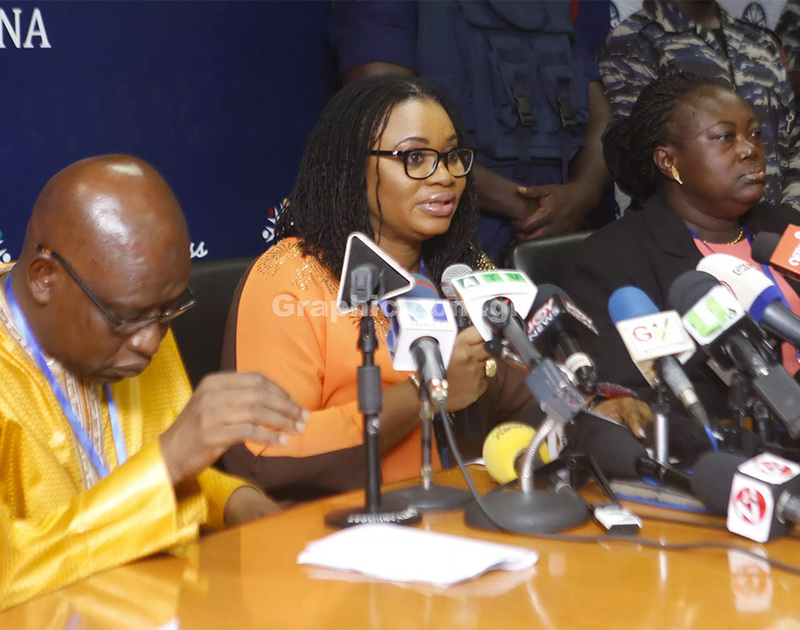 The Government yesterday issued a press statement announcing the removal from office of the Chairperson of the Electoral Commission, Mrs. Charlotte Osei, and her two deputies, Mr. Amadu Sulley and Mrs. Georgina Opoku Amankwa upon the recommendations of a Committee that was set up by the Chief Justice on the basis of Article 146 of the Constitution. The Committee recommended their removal from office on grounds of stated misbehavior and incompetence. Article 146(9) obliges the President to act upon the recommendations of the committee, which he did. Before the government issued the release, the President met each of them separately to inform them of the recommendation and gave them copies of the report of the committee. On the 25th of July 2017, the President received a petition against Charlotte Osei, and per the dictates of the Constitution, forwarded the petition to the Chief Justice the very next day. Subsequently, two other petitions against the two deputies, namely Amadu Sulley and Georgina Opoku Amankwa were also received, and same were forwarded to the Chief Justice. Once the petitions were sent to the President of the Republic, in accordance with article 146 of the constitution, the President’s only duty was to refer the petition to the Chief Justice, who shall determine whether there is a prima facie case. In other words, the President had no choice but to forward the petition to the Chief Justice. There were six allegations against the chairperson, four against Amadu Sulley and four against Georgina Opoku Amankwa. After the Chief Justice established a prima facie case in all three instances, namely six allegations against the Chairperson, four against each of the two deputies, she established a Committee, under article 146(4), to look into the allegations, where prima facie cases had been established. The same Constitution provides that under article 146(5) that the Committee appointed under clause 4 of the article, shall investigate the complaint and shall make its recommendations to the Chief Justice, who shall forward it to the President. The Committee, in accordance with the Constitution, was set up, investigated the allegations, called witnesses, and the respondents were represented by legal counsel. Once the recommendation has been forwarded to the President, article 146(9) offers the President no discretion but to act on the recommendation. For emphasis, it reads, “the President shall, in each case, act in accordance with the recommendations of the committee.” This, ladies and gentlemen, is exactly what has happened. After seven months, it submitted its report. This is not the first time article 146 has been applied. Indeed, in 2015, two petitions were filed for the removal of the then Chairperson of the Commission on Human Rights and Administrative Justice (CHRAJ). The Committee investigated complains of serious misconduct, inappropriate exercise of office, serious misjudgment and breaches of the law against her and recommended her removal to the President. Like now, President John Mahama, at the time, had no option but to act first on the petition, and lastly on the recommendation of the Committee. The Committee found that the “evidence before the committee proves that the Electoral Commission did not observe any prudent administrative and financial management of the 2015 political parties’ primaries. He was also asked to refund the amount of GHS320,822 which was found to be lost to the EC under his watch. The Committee also recommended that the Chief Accountant, Kwaku Owusu Agyei-Larbi be made to pay to the Commission the amount of GHS360,000 which he claimed was still in his custody for safe keeping, failing which he be charged with the offence of stealing. The same petitioner, who filed against Amadu Sulley, filed against the EC deputy chairperson in charge of Corporate Affairs. The Committee focused on four allegations. That she signed two contracts with Superlock Technologies Limited (STL) on 6 May, 2015 for $24,397,000 and $16,509,500 respectively without adhering to the provisions of the Public Procurement Act. Under her watch, EC staff endowment fund contributions for eight months, between 2013 and 2014, were not paid into the Staff Provident Fund at a time when she was Deputy Chairperson in charge of Finance and Administration and had direct supervision over the Fund. On the STL contracts, the Committee held that Mrs. Opoku Amankwa “demonstrated gross incompetence and misconduct in executing the two contracts, (1) by her failure to seek prior authorization from the PPA and (2) by concealing the fact that she had already signed the contracts when she instructed the Director of Finance to write to the PPA for authorization, and (3) having discovered the illegal act, she did not withdraw the contract and persisted with it, damning the consequences it would have on the EC, not even when the Electoral Commissioner started probing it.” The Committee further held that her action violated The Public Procurement Act, Section 40, and constituted a criminal offence under Section 92 of the same Act. On the allegation of the missing contributions to the Staff Endowment Fund, it was found that the contributions were wrongfully applied as “operational expense” of the EC and that the EC now has to refund the money. 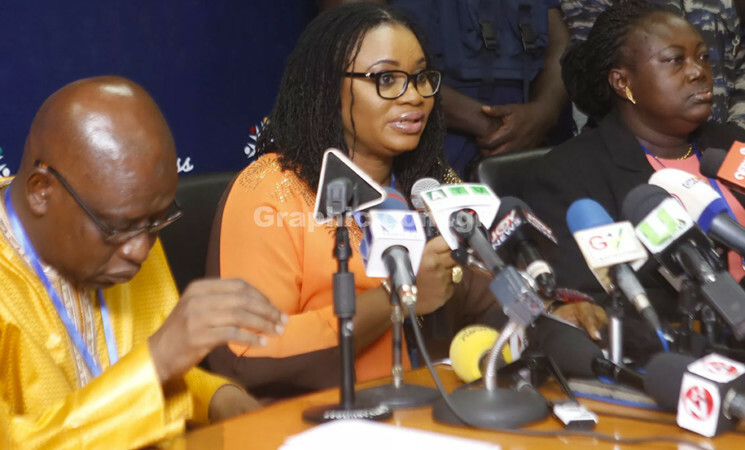 Mrs. Charlotte Osei gave evidence against Mrs. Opoku Amankwa, referring to heightened staff agitation over their missing funds. The Chairperson also gave evidence that she had undertaken internal audit and also invited EOCO to look into the matter. She failed to disclose the misapplication of the contributions when she was confronted by the then EC chairperson, Dr Afari-Djan and took no concrete steps to replace the funds, even years after they were misapplied. It was held that her actions and inactions had cost financial loss to the staff and, probably, the EC. On the two allegations, the Committee held she had misconducted herself and showed gross incompetence within the meaning of Article 146 of the Constitution and recommended her removal from office as a Deputy Chairperson of the EC. The Committee looked into six allegations against the Chairperson. The second allegation was that the Chairperson of the EC unilaterally abrogated a duly procured contract with an entity, STL, and awarded the same contract to the same entity without recourse to the Commission and without due process of the Public Procurement Act. The Committee found that upon her appointment in June 2015, Mrs. Osei detected some irregularities with the STL contract which was yet to be performed and was right to have abrogated it. However, the Committee found that her decision to unilaterally award fresh contracts to the same STL in the aggregate sum of $22,340,814 was illegal. That she failed to comply with the internal procurement procedures of the Electoral Commission created by the Commission itself, namely the Entity Tender Review Panel, and the Public Procurement Act. All in all, she awarded 12 contracts to STL for the supplies of ICT equipment and services and the Committee found that only one of the 12 did not exceed her procurement threshold as Chairperson, which was GHS50,000 for goods and services before July 2016. All the letters awarding the 12 contracts to STL were signed by the Chairperson herself between 8th February 2016 and 25th November 2016. The Committee held it “to be very absurd coming from the Chairperson, the very person who led the crusade to abrogate the initial STL contracts, citing breaches of the Public Procurement Act. The third allegation is over the decision to acquire a new office block for the Commission. The Committee found that the Chairperson breached the law on procurement in awarding contracts for works and consultancy service for the new building. The Public Procurement Authority in February 2016 granted approval to the EC to award the contract for consultancy service for partitioning the new offices, at the contract sum of GHS98,100 as requested by the EC. Again in April 2016, the Chairperson wrote to the PPA for another restricted tender for internal partitioning of the new office block at a total cost of GHS3,410,268. This was also granted. The Committee found that the two contracts for the partitioning of the new office block and the contract for the consultancy service were not put before the Entity Tender Committee as created by the Public Procurement Act and the EC’s own internal procedures. The Committee further held that the contracts awarded far exceeded the threshold legally allowable to her per the procurement laws. The contracts awarded were GHS3,976,244 instead of the approved rate of GHS3,410,263 and GHS209,443 instead of the approved figure of GHS98,100. The Committee therefore held both to be unlawful. The evidence of witnesses given against the Chairperson were by her own staff, namely the Head of Procurement Unit of the Commission and also the Principal Electoral Officer. The fourth allegation is about the award of contract for the construction of pre-fabricated District Offices for the Electoral Commission and contract for consultancy for the pre-fabricated works against the procurement rules. From the evidence, the Committee held that the construction of the offices was divided into four lots and the Chairperson personally awarded all four at the higher rate $14,337,962. This was in excess of $6,837,962.53 and that she awarded the contracts without reference to the Entity Tender Committee as required. To stress, the Committee found that the value of the pre-fabricated office buildings was stated as $7.5 million in the letter to the PPA but the contract was awarded by the Chairperson for $14.3 million. The fifth allegation was about the use of donor support of $76,000 by the USAID grant for the EC’s ICT environment. The contract for the design of the EC’s website was also held to be illegal since she awarded the contract without recourse to the rules of procurement. The last allegation was also about the use of donor funds for an award to repackage the strategic plan of the Commission, funded by the UNDP and to develop a new logo for the commission. That also was in breach of the procurement law. The Committee concluded that enough evidence had been established, and, therefore, recommended her removal as the Chairpersons of the EC based on misbehaviour and incompetence. It further recommended that the EC ceased using the services of Messrs Sory@Law as solicitors but that the firm be paid for its legal services rendered. Ladies and gentlemen of the media, we need to conclude by reiterating what is obvious – that this removal of the Chairperson of the EC and her two deputies, has nothing to do with the President, his government, the NPP or, indeed, any political party. It is purely an internally generated matter. The matters that became the subjects of the petitions against the former Electoral Commissioner and her colleagues were the same set of allegations which they themselves threw against one another in the media and in the public space, including Mrs Oei’s allegation that Mr Amadu Sulley misused GHS6m from the political parties and the counter allegation against her that she abused the procurement processes in several contracts. What we have seen appears to be high simmering tensions within the Electoral Commission, which resulted in an implosion after the 2016 elections. These are the facts of the matter and these are the very facts that the Constitution of the Republic were applied against. Remember that the President took an oath to abide by the dictates of the Constitution of Ghana, failing which he pledged to subject himself to penalties arising therefrom. He has done nothing more or less than to uphold the Constitution of the Republic of Ghana. It would be tragic for the country, in the face of these facts and circumstances, for anyone to attempt to turn this matter into a party-political affair. Those who do so do not seek the welfare of the country. It is our hope that Ghana, after these trying events, will end up with electoral body that will uphold the dignity and integrity that the is demanded of the office and its servants.